I was excited to receive this book in the mail, it's a decent size book with the most gorgeous styling and illustrations - the cover makes you want to dive right in. The illustrations are similar to Disney type characters which is familiar for children. Separated into two sections: Old Testament Stories and New Testament Stories, each story takes a portion of scripture and writes it in easy to understand language for children. 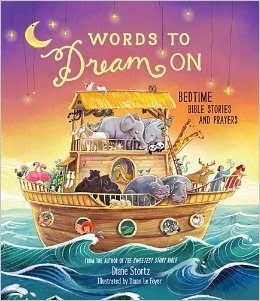 It also includes a 'Words to dream on' section which is generally a key scripture and a 'Sleepytime Prayer' or 'Bedtime Blessing' for each. This is a gorgeous book that I look forward to reading at bedtime with my son in the days to come. Highly recommend! Please note I was sent a copy of this book for review from Booklook however the opinions are completely my own.